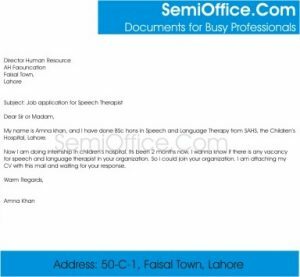 Job application for Speech Therapist in school or hospital, therapy center to inquire about vacancies of speech and language therapist for special children, special persons, disable children, language patients etc. My name is Amna khan, and I have done BSc hons in Speech and Language Therapy from SAHS, the Children’s Hospital, Lahore. Now I am doing internship in children’s hospital. Its been 2 months now. I wanna know if there is any vacancy for speech and language therapist in your organization. So i could join your organization. I am attaching my CV with this mail and waiting for your response. I saw the vacancy you posted for speech therapist on your official website and after reading all the requirements I can say I am the right fit for you. I have done four years bachelors in pharmacy and then I have done my masters in communications disorder. When I was in my final year of master’s degree I was also volunteering at an autism spectrum disorder institution where my job was to communicate with people who have autistic disorder. Volunteering at that institute taught me a lot about the importance of communication and how easy we take it. Then I also did my internship at a clinic where I was an assistant to the therapist whose specialization was in people who have Tourette’s syndrome. I have mentioned all my qualification and past experience that I think is related to the job you mentioned. I am writing this letter to apply for post of Speech Therapist under ad no 3 of California Newspaper. I strongly believe that my experience in the field of therapy and qualifications make me a potential candidate. I have a Master’s degree in Psychology from XY University, followed by an experience of 8 years in ABC mental clinic. During which I have a successful result with a long list of clients who always give happy remarks about my work. I have done additional diplomas and workshops. All the relevant documents with detailed experience letters are attached to this application. I am looking forward to an interview call as it will allow me to present my skills effectively in person. Thank you very much in advance for your time and consideration.